Not to be confused with Þingeyrar. 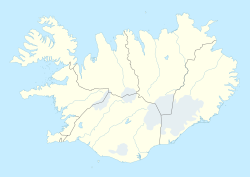 Thingeyri (in Icelandic written Þingeyri) is a settlement in the municipality of Ísafjarðarbær, Iceland. It is located on the coast of the fjord Dýrafjörður in the mountainous peninsula Westfjords (in Icelandic written Vestfirðir). It has a population of approximately 260. Continually inhabited since 1787, Þingeyri is one of the oldest settlements in the Westfjords and the first trading post established there. It is believed to derive its name from a medieval assembly (þing) and has ruins of a medieval booth believed to have been used by visitors to the assembly. Thanks to its sheltered location Þingeyri developed into a significant fishing center. In the 19th century the French applied for permission to establish a base there to support their fishing operations in the area but were turned down. In the years 1884-1898 the town served as the base for American halibut fishing in the region. In 1909 a hospital was founded in the village and in 1910-1911 a church was established. In 1957 an airport for medical transport, with a runway of 300×20 meters, was taken into use. The church of Þingeyri, consecrated in 1911. In 1995, the inhabitants of Þingeyri voted in favor of a merger with Ísafjörður, Suðureyri, Mýrahreppur, Mosvallahreppur and Flateyri to form the new municipality of Ísafjarðarbær. Of the six municipalities involved, Þingeyri had the lowest rate of approval for the merger with 130 voting in favor and 71 voting against. The nearby mountain of Sandafell, accessed by driving or hiking, is a tourist destination known for its scenic view. The altarpiece of the church was painted by Þórarinn B. Þorláksson. It shows Christ with three girls in an Icelandic landscape. ^ a b c Íslenska alfræðiorðabókin, p. 563. ^ a b c Leffman, p. 207. ^ a b c d Simmonds, p. 243. ^ a b Harding, p. 160. ^ "Sjúkraflugvöllur tekinn í notkun á Þingeyri", Morgunblaðið, November 12, 1957, p. 20. Dóra Hafsteinsdóttir and Sigríður Harðardóttir (eds.) (1990). Íslenska alfræðiorðabókin P-Ö. 1990. Reykjavík: Örn og Örlygur hf. Guðrún Edda Gunnarsdóttir. Þingeyrarkirkja. From the Þingeyri official website. Last accessed October 12, 2007. This page was last edited on 28 June 2018, at 01:07 (UTC).